I Me My: "Sita Sings the Blues" - A Storm (if even), in a Teacup? "Sita Sings the Blues" - A Storm (if even), in a Teacup? 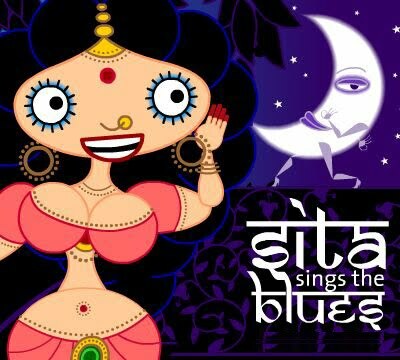 Nina Paley's animation film "Sita Sings the Blues", released this month, was recommended by a friend who normally refrains from giving recommendations, and so I had to see this one. As we all know by now, religion and the rendition of it in any artistic genre, comes under immediate and intense scrutiny. The Danish cartoons on Muhammad, M.F. Husein's paintings of Hindu gods, Salman Rushdie's The Satanic Verses, or the most recent controversy about a "South Park" episode on Comedy Central, created by Trey Parker and Matt Stone; all of these have received unprecedented coverage in the press, worldwide. No surprise then that Ms. Paley has been receiving hate mail after 'Sita Sang Her Blues' in the voice of a 1920 jazz vocalist Annette Hanshaw. 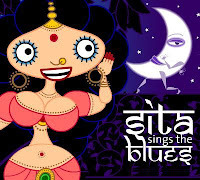 Moreover 'Sita', the much worshiped epitome of Indian womanhood, has a"Betty Boop Goes Hollywood' appearance in the film as she croons and swoons to the fickleness of love and lovers; a far cry from the sari clad traditional image of Sita in Hindu mythology. Ms. Paley had several things going on simultaneously in the film besides the plot line of the Indian epic, The Ramayana. She inter-twined the story of Sita with the story of her own heart break in marriage, all within an 80 minute movie. Clearly, this was taking a monumental risk given our current day religiously sensitive audiences. Ms. Paley was obviously willing to take that risk and more because she introduced yet another controversial feature in this film; she had three commentators with pronounced Indian accents interpreting events in the Ramayana, and they did it with obvious uncertainty like that of second generation Indians living in the US. Those comments are made in a lighter tone like the one used among close friends, but to an avid Hindu they could easily sound blasphemous. Nothing the three say is really new or essential and yet Ms. Paley chose to have them in the film. The movie was certainly not ground breaking, in fact quite ordinary as far as the storyline was concerned; a lack-luster retelling of an ancient epic. Hanshaw's jazz vocals were perhaps the saving grace. Luckily for the movie maker, the Western audience, seeing an Indian Epic in animation mode, may perhaps be intrigued and then impressed by what Ms. Paley created because, “We see so many films, and when you come across one like this, you just feel like you’ve stumbled upon a gem.” (Alison Dickey, a film producer and one of the jurors at Spirit Awards). I don't think I would recommend the movie though"Sita Sings the Blues" has definitely generated immense interest among staunch Hindus as also with Hindu bloggers who feel affronted by Ms. Paley's blasphemous presentation of 'their gods'. Consequently the movie will draw an audience, recover its making cost, and the artist Ms. Paley will not be faced with penury for having ventured into new grounds. No artist deserves that fate; certainly not Nina Paley, a respected comic strip writer. first time hearing of this movie.religion and religious figures should be seperated. To me it seems a bit absurd to use a religious figure like that (any religion). However in her defense, it is a very inexpensive way to guarantee fame (or notorious status) to the author, director, playwright or whoever choose this path. My take is, its simply plagiarism to use the Ramayana or any religious epic in any form, the characters were already developed and part of the original, why the need to desire to expound or re-shape a character, that was so well developed already? Character development is a skill, remember Schulz and Watterson, skilled, because of the originality in character. This appears to buy into the same principle as the Passion of the Christ. In both cases it just seems kind of cheap and un-original to do so. A dancer wanting to be known by her art, will dance for her audience portraying her body to become a rhythm, on the other hand a dancer who does it for the fame can obtain it without ever really dancing, the costume can open doors for her. Sorry I know that this was long, and mind you my voice is barely a whisper, just the unrestrained midnight thoughts forged from reading your post. It is interesting how Reel 13 says that Nina Paley has no rights to compare herself with Sita. This just reflects the hypocrisy of Hindu society. On one hand hindu women are expected hold Sita as their ideal but when it comes to "heartbreak" why can't a woman associate herself to the pain of Sita? In Catholic traditions Mother Mary is revered because of what she went through as a mother of Jesus. Christian women, thus have a point of reference in their religion when it comes to pain, suffering and drawing strength from crisis. All Hindus who believe that Nina Paley has done a blasphemous act should then dig into their scriptures and take out evidence of Sita's strength and display it to the world in the way they think is appropriate. Paley has just done what she thinks is right. There is a spiritual side to the concept of unconditional love that Nina Paley fails to capture. Well, was expected from a comic strip writer. Moreso, I found the entire piece offensive. Physically, Sita was commoditised to the concept of a woman in Western society and spiritually she was bought to a blues singing sad woman. Nina failed to capture the inner strength and the countenance of a woman who went through so much and yet unconditionally loved Ram. Much like the love of Mirabai and Radha, Sita's love transcended the physical barriers. Its a love above the forces of nature and is about surrendering your spiritual being. It takes more than just reading Ramayana to understand that.